If you want to take a break from green bean casserole at Thanksgiving and try something, well…, schnockered, then we suggest a few unique side dishes like Tipsy Plum or Cassis Cured Red Cabbage. Just follow the links to those recipes below. Of course, you can also complement the turkey and please your guests with tried and true German Beilagen (side dishes) including Schupfnudeln, a Swabian form of gnocchi; Spaetzle, a specialty from Southern Germany; Grünkohl, green cabbage or kale; German red cabbage (which has a different taste than US versions); Reibekuchen (potato pancakes); Semmelknödel (bread dumplings) or Kartoffelknödel (potato dumplings). For convenience, you can purchase some of these products online or in your local specialty food store. Look for brands like Bechtle, Mecklenburger, Hengstenberg, Panni, Maggi, or Kühne. Guten Appetit! Braised spiced plums with wine and brandy makes a side dish that adds some extra spiff and flavor to meals featuring turkey, pork, duck or beef. Fresh or jarred red cabbage gets both spiced and spiked in this side dish with the flavors of apple, currant, clove and cinnamon. A great festive side dish for a year-end meal, such as Thanksgiving dinner, St.Martin’s goose or Christmas dinner. Like gnocchi, Schupfnudeln are not pasta, but potato based. 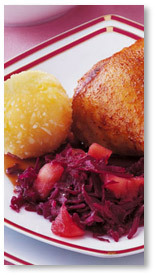 When crispy fried, this Southern Germany delicacy is the perfect accompaniment to sauerkraut, red cabbage, turkey, duck or pork. A wonderful spice mix reminiscent of German gingerbread spice in this recipe from Chef Olaf turns this fairly simple red cabbage recipe into the epitome of comfort food. Double smoked bacon gives this sauerkraut dish its depth, while fresh apples, juice and spices round off this crowd-pleasing recipe from Chef Olaf. A colorful salad for the buffet table that’s great as a festive side dish and hearty enough to be a vegetarian meal.